Reviews of Best YouTube Movie Video Downloader and Converter. YouTube is a veritable library to offer watchers a cornucopia of funny videos, pleasant music videos and abundant movies. Yes, you may have tried every probable way to download YouTube marvelous movies and convert to mobiles for enjoying in travel or during a business trip. Why don't you make use of YouTube movie video downloader and converter to get YouTube movie with no effort at all? Here, I will list 2018 best 3 YouTube movie downloader and converters for helping you download and convert YouTube movie videos for playback on PC/Mac/devices. WinX HD Video Converter Deluxe - An all-in-one online video downloader and converter, which is surely capable of downloading and converting YouTube movies, music videos/playlists to iPhone, iPad, iPod touch, Android, Windows Phone, Xbox, PS4, HDTV etc, at will. WinX HD Video Converter Deluxe is powerful on downloading YouTube movie and converting to other mainstream videos formats, such as AVI, MOV, WMV, MP4 for playback on PC/Mac/Mobiles. Because of utility of High Quality Engine, Hyper-threading Technology and Multi-core, WinX HD Video Converter Deluxe can export videos with greater image quality at a high speed. It is very convenient to download and convert YouTube movies with WinX HD Video Converter Deluxe in that the YouTube movie URL will be automatically detected when you opening the movie in a new tab of browser and output profile dialog box will pop up directly the moment downloaded movie is added to convert list without any guesswork. This top YouTube movie downloader and converter provides a large range of output profiles, including the latest portable devices, for example iPhone Xs, Samsung Galaxy S9 and it will keep profile updating on the basis of the new released phones and tablets. Solid YouTube Downloader and Converter enables you to batch download and convert YouTube movies to MP4, AVI, FLV, iPhone/iPad/iPod and Android devices. Besides, you can optimize YouTube download speed and custom YouTube video quality for a better output result. When downloading YouTube movies, you should copy and paste YouTube URL manually. Different from WinX HD Video Converter Deluxe, Solid YouTube Downloader and Converter just gives video name and file size, but no video versions with multiple resolutions and file formats. Although Solid YouTube Downloader and Converter provides numerous output formats, some devices, for example Amazon Kindle Fire, Microsoft Surface and latest mobile models, HTC New One, iPod Touch 5 etc, are not supported. You need to convert videos to a completely compatible format with video parameters adjustment if playing YouTube movies on these unsupported portable devices. YTD Video Downloader is another handy YouTube movie downloader and converter which can easily download movies from YouTube with download quality setting and convert YouTube to AVI, MOV, MP4 etc, for playback on PC/Mac/Mobiles. Integrated a tiny player, you can preview movies during conversion with this YouTube movie downloader and converter. YTD Video Downloader is capable of detecting URL of YouTube movies in browser as well, but there is no analysis result of video name, duration, resolution and other information. About conversion, YTD Video Downloader supports much lesser output profiles, especially for portable devices, only iPhone, iPad, iPod, PSP and Cell phone without detailed models for selection. Furthermore, YTD Video Downloader is bundled with adware that Ask Toolbar will be installed by default and your homepage of browser will be set as ask.com. In fact, you may feel very uncomfortable with this activity even if you can uncheck the bound options during installation. The following feature table can help you learn more about the top 3 YouTube movie downloader and converters. Reviews and feature comparison table can prove that WinX HD Video Converter Deluxe is the best YouTube movie downloader and converter to offer a very convenient and efficient solution to download movies from YouTube and convert to other popular video formats and plentiful portable devices. Get guide to download and convert YouTube movie videos with this best YouTube movie video downloader and converter. 1. Access to Downloader control and click "Add Video" to pop up a downloader window. 2. Copy YouTube movie URL online and then click "Paste URL & Analyze" to get video info, incl. title, duration, options of resolution, format, size and codec. Select one option and click "Download Selected Videos" -> "Download Now" to fast get it downloaded to computer. 3. 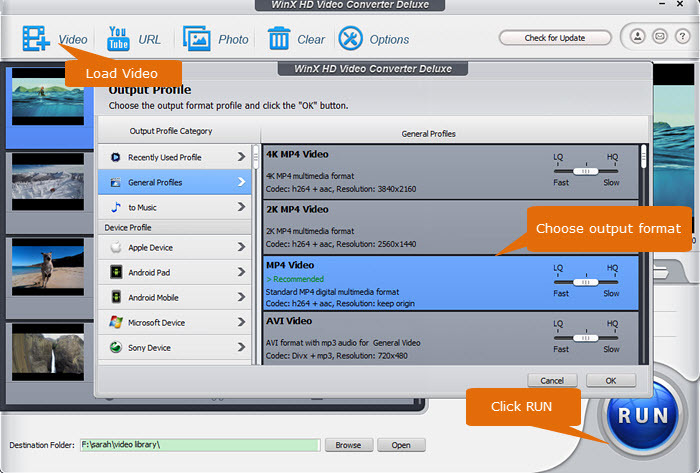 Open the saving folder, and then go ahead to Video control of WinX HD Video Converter Deluxe, where you can add downloaded YouTube movie video by dragging. 4. Set target format (e.g MP4 H.264) or device (e.g iPhone Xs) to convert from profile list. 5. Set destination folder and click "RUN" to start YouTube movie conversion. Best Fastest Video Downloader, Converter, Editor, and Recorder for Windows (10) and Mac with Level-3 Hardware Acceleration.